As mental health professionals, we have seen our share of tragedies and human misery, but usually perhaps because the patients are at the point of seeing us, there is usually a ray of hope for reaching to the future for a better life. There was very little optimism in this very well-done portrait of a man who is deeply and continually in psychological pain. Kenneth Lonergan, playwright, now turned director in his previous writings (You Can Count On Me and Margaret) has mastered the writing of tragedies that may befall anyone of us. 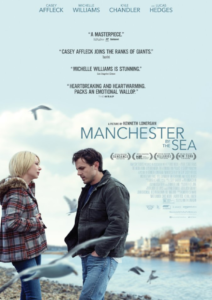 In this film, Casey Affleck plays Lee Chandler who lives a life overwhelmed with guilt for what happened to his family. He then is faced with the responsibility of caring for his teenage nephew (Lucas Hedges) whose father recently died and whose mother has not been sober or on the scene for many years. The details of the story unfold with a series of well-done flashbacks which not only framed the story but also introduced bleak but atmospheric life in a New England fishing village. The classical musical score in the background defined the sad somber mood of the story. There were some somewhat lighter moments as we glimpsed at interactions of the teenage boy and his multi-girlfriends. Casey Affleck deserves the accolades that he is getting for his performance in this movie. His facial expressions, voice and mannerism convey what his character has gone through and also the empathy that he has for his nephew. Michelle Williams as his ex-wife has a relatively small role but she is superb in her one important scene.